(EN) Often, success is really just a matter of assembling the right team at the right time – which was just the case at our recent team lunch with our friends from Thai & Techno. (EN) Event series Thai & Techno is the brainchild of Bianca Shu, de facto spokesperson for the creative minds at Opal Collective. 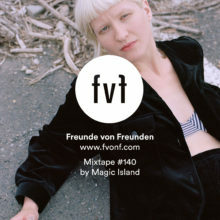 The six-member group came together somewhat spontaneously, bonding over a shared desire to throw a new kind of party in Berlin. Just six weeks after forming the collective, they launched their first Thai & Techno event, each leveraging their individual expertise: three Opal Collective members are DJs and collaborate with a series of guest artists to provide the techno, while Bianca draws on lessons learned in the kitchen of her father’s Thai restaurant to prepare the dishes. Their design-based approach to event planning – which emphasizes thoughtful details, curated cocktails and sumptuous food – was immediately well-received. They ran out of food when hundreds of people showed up for the second incarnation of Thai & Techno; since then, they’ve learned to adapt their parties to the ever-increasing crowds and are already seeking opportunities to branch further into new territory. (EN) Alongside public relations expert Danée and co-founder Christoph, Bianca arrived at the FvF Apartment to arrange a miniature version of Thai & Techno for a recent Team Lunch. The three worked so harmoniously together, it was hard to imagine the hectic environment they describe behind the scenes at their events. As mid-morning light warmed the kitchen, their methodical preparation and unhurried movements set the tone for the day. Bianca took time to instruct her assistant chefs on the finer points of cooking utensils – “metal on metal doesn’t feel right; I always use a wooden spoon when I’m making a curry” – and revealed the flavorful secret weapon of Thai cuisine: coriander root. 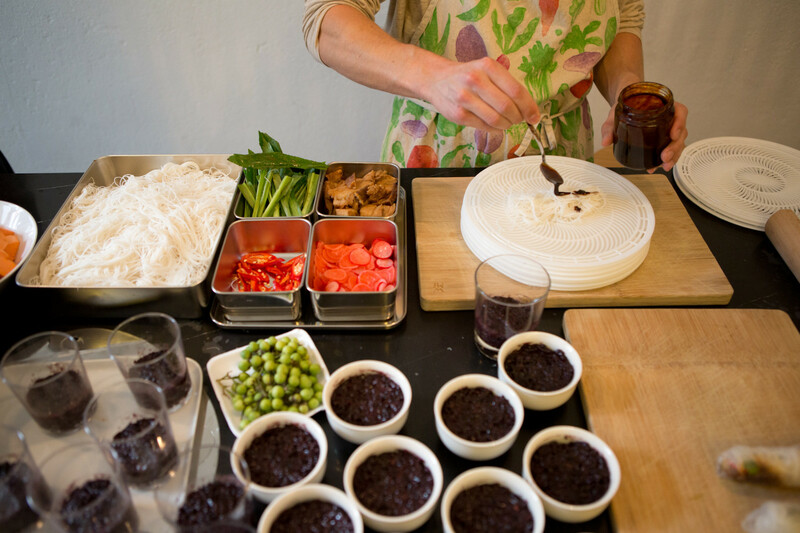 She learned all this from the best: her father trained at Thai cooking school and was the driving force behind the flourishing Asian culinary scene in their hometown of Darwin, Australia, which once looked askance at Thai food. When starting out, he convinced local farmers to grow new crops, like lemongrass, so that he would have access to fresh, local produce. Now, thanks to his pioneering work, Asian restaurants thrive in the city. 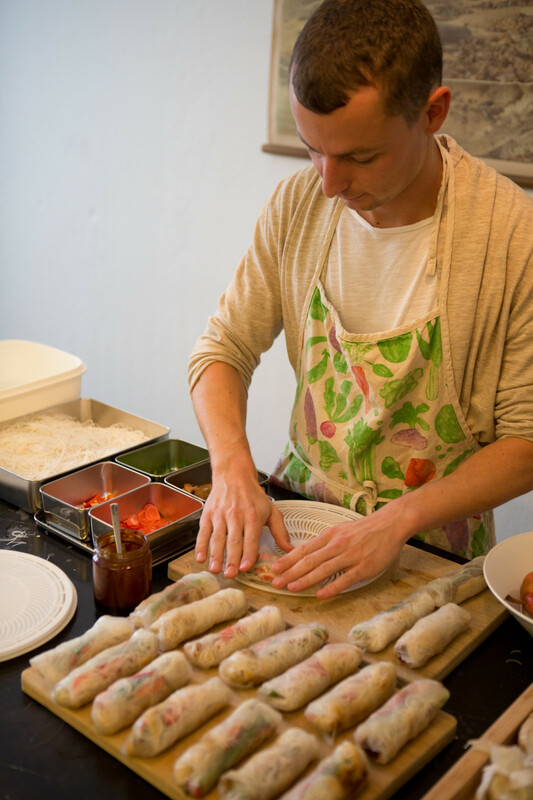 (EN) As a starter, the cooks served Thai Roast Pork Summer Rolls, each carefully assembled by Danée and Christoph and containing exactly one pepper (so as not to overwhelm sensitive palates). Marinate the pork belly with the mixture above for about 8 hours (or overnight if possible), reserving about 80-100 ml for wrapping the rolls later. Prepare the pickled radishes by placing sliced radishes in an airtight container or jar along with the vinegar and sugar. Allow to rest for 4-8 hours. Once you’re ready to roast the pork, set your oven to 175 degrees and roast the pork belly for 1 hour and 15 minutes. To ensure the meat is moist, add a bit of water to the roasting dish before putting it in the oven. Whilst the meat is cooking, prepare the rest of your ingredients. Wash and trim the ends of your long coriander, cutting them in half so that they’re about 10 cm long. Set aside. Soak vermicelli noodles in room temperature water for 10-15 minutes or until just soft, drain and set aside. Once the pork is tender, remove it from the oven and let it rest for 15 minutes. Reserve the juices for later. Slice the pork into 3 mm wide strips and let the slices sit in the juices from the roast. Lay out all your ingredients for the roll so you have everything handy: the noodles, the radishes, the sliced pork, the leftover marinade and the long coriander. Soak rice paper in room temperature water until just soft. 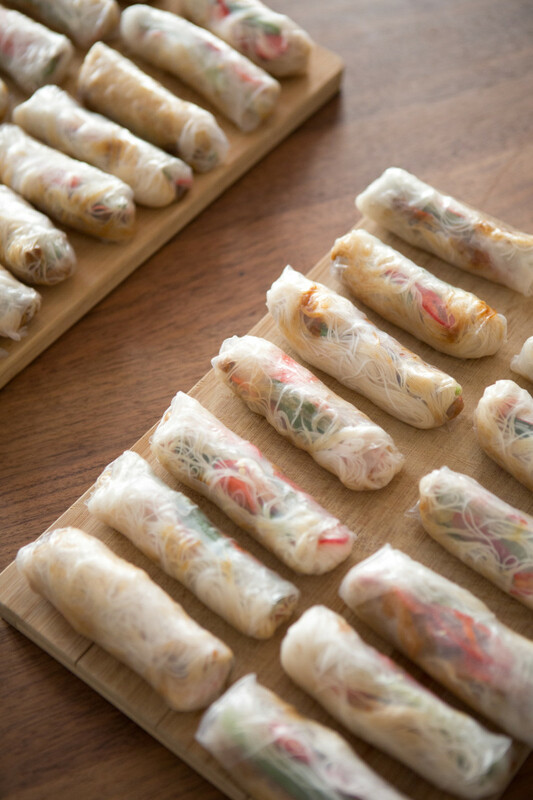 Take a small handful (about 20 g) of vermicelli noodles and place in the center of a sheet of rice paper, only a few centimeters above the bottom edge. Add a few pieces of pickled radish, roast pork and long coriander. Finish off with a light drizzle of the reserved marinade from the pork and get ready to roll. 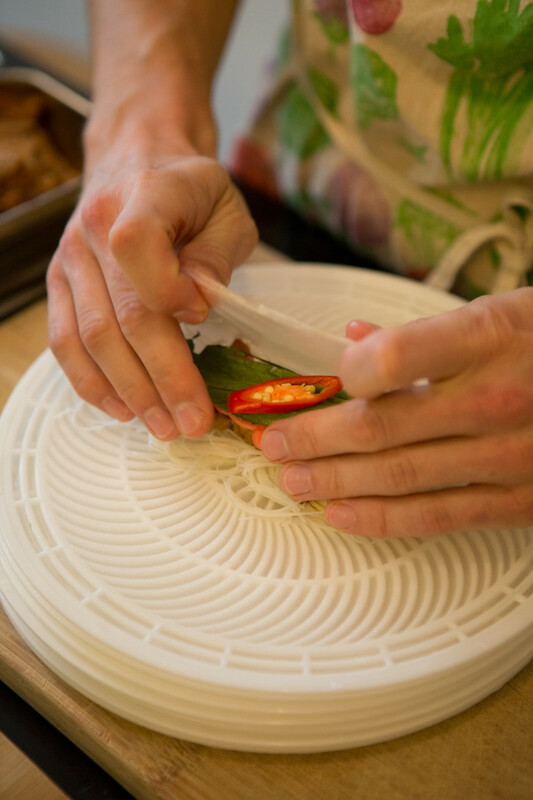 Enclose the sides of the rice paper roll, sealing the edges above and below the filling. Then fold the base upwards, and continue to tightly roll until you reach the top edge. Press lightly to seal. (EN) Thank you, Bianca, Christoph and Danée, for carefully preparing your specialties for us to taste. Find more on Opal Collective and their upcoming events – including the next Thai & Techno party – on their website and Facebook page. Check out their Soundcloud page for the techno mix played during lunch. Stay tuned for our second part of the thai series coming up next week. 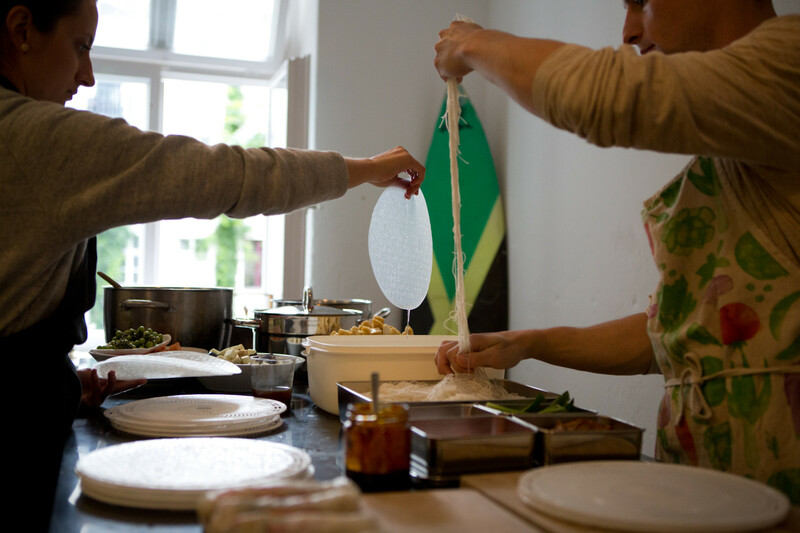 Until then, our FvF Cooks stories will keep your appetite worked up.